Farbar Recovery Scan Tool (FRST) is a diagnostic tool incorporating the ability to execute prepared script solutions on malware infected machines. It will work equally well in normal or safe mode and where a machine has boot up problems it will work efficiently in the Windows Recovery Environment. Its ability to work in the recovery environment makes it particularly useful in dealing with problems associated with machines experiencing difficulty when booting up. This tutorial was originally created by emeraldnzl in consultation with farbar and with the kind co-operation of BC (Bleeping Computer) and G2G (Geeks to Go). emeraldnzl has since retired and now the tutorial is added to and maintained by picasso in consultation with Farbar. Permission of both picasso and Farbar is required prior to using or quoting from the tutorial at other sites. Also note this tutorial was originally authored to offer guidance to helpers offering malware removal assistance at various forums. Trusted helpers and experts who have the requisite access may keep abreast of the latest tool developments at the FRST Discussion Thread. One of FRST's strengths is its simplicity. It is designed to be user friendly. Lines containing references to infected items can be identified, copied from the log, pasted into Notepad and saved. Then with a press of a button the tool does the rest. This allows for great flexibility, as new infections appear they can be identified and included in a fix. Farbar's Recovery Scan Tool is designed to run on Windows XP, Windows Vista, Windows 7, Windows 8 and Windows 10 Operating Systems. There are two versions, a 32-bit and a 64-bit version. Note: FRST64 is not designed to run on XP 64-bit systems. FRST creates a log covering specific areas of the Windows Operating System. This can be used for initial problem analysis and to tell you some information about the system. The tool is under constant development, part of which includes the addition of new malware identification labels. Accordingly, it is strongly recommended to regularly update. If the computer is connected to the internet there will be an automatic check for available updates when FRST is opened. A notification will appear and the latest version can then be downloaded. Where new infection manifests or update is not possible e.g. no internet connection for whatever reason, the expert needs to be abreast of latest developments in the malware infection field to enable early pinpointing of the problem. The lay user should seek expert help when new infections appear or when they find difficulty in identifying the problem on their machine. By default, like many other scanners, FRST applies whitelisting. This avoids very long logs. If you do want to see a full log; then the relevant box on the Whitelist section should be unchecked. Be prepared for a very long log that may have to be uploaded as an attachment for analysis. FRST whitelists the default MS entries from the registry. In the case of Services and Drivers the whitelist covers not only the default MS services but also all other legitimate services and drivers. Any service or driver file without a company name is not whitelisted. No security program (AV or Firewall) is whitelisted. The SPTD service is not whitelisted. Make sure FRST is run under administrator privileges. Only when the tool is run by a user that has administrator privileges will it work properly. If a user doesn't have administrator privileges you will see a warning in the header of FRST.txt about it. In some cases a security program will prevent the tool from running fully. Generally there won't be a problem but be alert to the possibility that when a scan is requested that a security program may prevent the running of the tool. When fixing it is preferred to disable programs like Comodo that might prevent the tool from doing its job. A general recommendation to everyone is that when you are dealing with a rootkit, it is better to do one fix at the time and wait for the outcome before running another tool. It is not necessary to create a registry backup. FRST makes a backup of the registry hives the first time it runs. The backup is located in %SystemDrive%\FRST\Hives (in most cases C:\FRST\Hives). See the Restore From Backup: directive for more details. FRST is available in a number of different languages. Helpers tend to use English as their language of choice for problem analysis. Where a helper or someone seeking help wishes to provide logs in English, just run FRST by adding the word English to the name e.g. EnglishFRST.exe or EnglishFRST64.exe or FRSTEnglish.exe or FRSTEnglish64.exe. The resultant log will be in English. Note: You need to run the version compatible with the user's system. There are 32-bit and 64-bit versions. If you are not sure which version applies, have the user download both of them and try to run them. Only one of them will run on the system, that will be the right version. Once FRST has completed its scan it will save notepad copies of the scan in the same location that FRST was started from. On the first and subsequent scans outside the Recovery Environment a FRST.txt log and an Addition.txt log will be produced. Copies of logs are saved at %SystemDrive%\FRST\Logs (in most cases this will be C:\FRST\Logs). Care, Very Important: Farbar Recovery Scan Tool is non invasive and in scan mode it cannot harm a machine. However FRST is also very effective at carrying out instructions given to it. When applying a fix; if it is asked to remove an item; in 99% of cases it will do so. While there are some safeguards built in they are necessarily broad based and designed not to interfere with removal of infection. The user needs to be aware of that. Used incorrectly (that is if requested to remove essential files), the tool can render a computer unbootable. If you are unsure about any items in a FRST report always seek expert help before administering a fix. FRST has a range of commands and switches that can be used both to manipulate the computer's processes and to fix problems you have identified. 1. Fixlist.txt method - To fix identified problems, copy and paste the lines from the FRST logs to a text file named fixlist.txt and saved in the same directory the tool is run from. 2. Ctrl+y method - The keyboard shortcut can be used to automatically create and open an empty file to be filled. Launch FRST, press Ctrl+y to open the file, paste the fix, press Ctrl+s to save. Let the user copy the whole content including Start:: and End:: and click Fix button. To fix an entry with Unicode characters in it, the script should be saved in Unicode otherwise the Unicode characters will be lost. Ctrl+y shortcut saves the text file in Unicode. But in case of fixlist.txt created manually a proper encoding has to be chosen in Notepad (see below). Copy and paste the entries into the open Notepad, select Save As..., under Encoding: select UTF-8, give it fixlist name and save it. And FRST will not be able to process the entries. Some users alter logs by removing or replacing a user name. To make sure that correct paths are processed in a context of a single loaded account you can replace the potentially manipulated user name in paths with CurrentUserName. FRST will automatically translate the keyword to a correct user name. Note: The method is not supported in the Recovery Environment. To prevent FRST from hanging for hours due to incorrect scripts or other unexpected circumstances, the total time of the whole fix is limited to 40 minutes. Items moved by the fix are kept in %SystemDrive%\FRST\Quarantine, in most cases this will be C:\FRST\Quarantine until clean up and deletion of FRST. For detailed information about preparing fixes see sections below. To remove automatically all files/folders created by FRST and the tool itself rename FRST/FRST64.exe to uninstall.exe and run it. The procedure requires a reboot and works only outside of the Recovery Environment. On the first and subsequent scans outside the Recovery Environment a FRST.txt log and an Addition.txt log are generated. An Addition.txt log is not produced when FRST is run in the Recovery Environment. First line: tells whether FRST 32-bit or 64-bit variant has been run. The version identifier of FRST is also shown. The version identifier is particularly important. An old version may not have the most up to date functionality. Second line: shows what user ran the tool and under what permissions. This can alert you to whether the user has the appropriate permission rights. The line also shows you the computer name together with what date and time the tool was run. Sometimes a user will inadvertently post an old log. Third line: tells you where FRST was run from. This may be relevant for fix instruction if it has run from somewhere other than the Desktop. Fifth line: records the edition of Windows on the machine including major updates (Version and OS build on Windows 10, "Update" on Windows 8.1, Service Pack on Windows 7 and older) together with the language used. This may alert you to a problem with updates if the updates are not the latest. Sixth line: gives you the version of Internet Explorer (on Windows 7 and older) and the default browser. Seventh line: tells you what mode the scan was run under. Following that there is a line showing the tutorial link. Note: The information in a header run in the Recovery Environment is similar although it is necessarily truncated as user profiles are not loaded. When there are boot problems you may see something like "ATTENTION: Could not load system hive". That tells you that system hive is missing. Restoring the hive using LastRegBack: may be a solution (see below). "Default: Controlset001" - The notification tells you which CS on the system is default CS. Why do you need it? Normally you don't need it, but in a case where you want to look into or manipulate the CS that will be loaded when Windows booted, then you know which CS should be looked into or manipulated. Doing anything to other available CS has no effect on the system. There are two reasons why you might want to stop a process. First, you may want to stop a security program that might get in the way of a fix. Secondly, you may want to stop a bad process and then remove the folder or file associated with it. To stop a process include the appropriate lines from the FRST scan. Registry entries (keys or values) that are taken from FRST log and included in the fixlist to be deleted, will be deleted. FRST has a powerful deletion routine for keys and values. All the keys and values that resist deletion due to insufficient permissions or null embedded characters will be deleted. The keys that resist deletion due to access denied will be scheduled for deletion after reboot. The only keys that will not be deleted are those keys that are still protected by a kernel driver. Those keys/values should be deleted after the kernel driver that is protecting them is removed or disabled. When the entries from the log related to BootExecute, Winlogon values (Userinit, Shell, System), LSA, and AppInit_DLLs are copied to the fixlist the tool restores the default Windows values. Note: With AppInit_DLLs where there is one bad path, FRST removes that particular path from the Applnit_DLLs value without removing the rest. No need for any batch or regfix. The same applies to some other important keys/values that might be hijacked by the malware. Note: FRST does not touch the files the registry keys are loading or executing. Files to be moved must be listed separately with the full path without any additional information. The Run, RunOnce, Image File Execution Options and other registry entries if copied to the fixlist will be removed from the registry. The files they are loading or executing will not be removed. If you wish to remove them you must list them separately. When a file or shortcut in the Startup folder is detected, FRST lists the file on the Startup: entries. If the file is a shortcut the next line will list the shortcut target ( i.e. the executable that is run by the shortcut). To remove both the shortcut and the target file you need to include both of them. Note: The first line only moves the shortcut. Listing the second line moves the 1800947.exe file. If you only list the second line, the executable file will be removed but the shortcut will remain in Startup folder. The next time the system is started it will throw an error when the shortcut tries to run the executable and doesn't find it. To unblock security programs include the lines in the fixlist. Note: The Software Restriction Policies detection is generic and may result in flagging other legit entries created to protect from infections. See: How to manually create Software Restriction Policies to block ransomware. To reset the policies include the lines in the fixlist. FRST will prune GroupPolicy folders and force a reboot. Note: The detection is adjusted for a standard home computer with no policies configured and may result in flagging legit entries introduced manually via gpedit.msc. Including the line in the fixlist will trigger removing the whole key (it does not exist by default). Note: FRST also generates a warning in Addition.txt if SR is disabled even if it is not disabled by Group Policy but by the user. In that case FRST doesn't do anything. The user should be instructed to enable System Restore. There is no Group Policy preventing enablement. Apart from a few exceptions, items copied to fixlist will be removed. For registry entries that involve files/folders, the files/folders should be listed separately to be moved. This does not apply to browsers entries (except Internet Explorer), see the descriptions below for more details. 1. In the case of hijacked default entries, it will restore the default entry. 2. In case of custom entries, it will remove it and re-number the catalog entries. Where there are still custom Catalog9 entries to be fixed, they can be listed to be fixed. In that case FRST will remove the entries and re-number the catalog entries. Care: a broken chain will prevent a machine connecting to the Internet. To fix the issue, the entries can be included in the fixlist. If the hosts file is not detected, there will be an entry about not being able to detect hosts. To reset the hosts just copy and paste the line into the fixlist and the hosts will be reset. You will see a line in Fixlog.txt confirming the reset. The entries when included in the fixlist will be deleted. Note: In the case of StartMenuInternet hijacking for IE, FF, Chrome and Opera. The default entries will be whitelisted. When the entry appears in a FRST log it means that a non-default path is shown. There may or may not be something wrong with the access path in the registry and further investigation should be made. Where there is a problem the entry can be included in the fixlist and the default registry entry will be restored. Browser pages, SearchScopes (search providers) and other entries not involving files/folders: depending on the object type, FRST will delete items from the registry or restore their default state. URLSearchHooks, BHOs, Toolbars, Handlers and Filters can be copied into the fix and the registry entries will be deleted. Accompanying files/folders must be entered separately if they need to be moved. The HomeButtonPage and Session Restore entries when included in the fixlist will be deleted from registry. For Extensions entries, when included in the fixlist, the registry key will be deleted and the associated folder moved. FRST lists FF keys and profiles (if present) regardless of whether FF is installed or not. Where there are multiple Firefox or Firefox clones profiles FRST will list preferences, user.js, Extensions and SearchPlugins in all profiles. Non-standard profiles inserted by adware are flagged. FRST verifies Add-ons digital signatures. Unsigned Add-ons are labelled. FF Extension and other lines can be entered in the fixlist and the items will be deleted. See the Group Policy Objects description under Registry section for more details. FRST lists Chrome keys and profiles (if present) regardless of whether Chrome is installed or not. Where there are multiple profiles FRST will read the last used profile and list preferences of that particular profile. Extensions are detected in all profiles. Non-standard profiles inserted by adware are flagged. The HomePage and StartupUrls entries when included in the fixlist will be deleted. Processing other entries will result in a partial Chrome reset and a user may see the following message on Chrome settings page: "Chrome detected that some of your settings were corrupted by another program and reset them to their original defaults". FRST detects also New Tab redirections controlled by extensions. To remove the redirect identify a matching extension (if present) and properly uninstall it via Chrome tools (see below). An exception is an extension installer located in the registry (CHR HKLM and HKU labels). When the entry is included in the fixlist, the key will be deleted. FRST lists Opera keys and profile (if present) regardless of whether Opera is installed or not. Including a StartupUrls or Session Restore entry into fixlist triggers removal of the entry. Including an extension entry into fixlist triggers moving the extension. No need to include the path separately. To remove individual extensions click on the X for each item and then OK.
For browsers that are not shown in the log then the best option is a complete uninstall followed by a reboot and reinstall. Where you see [X] at the end of a listed entry that indicates that FRST could not find the files associated with the particular Service or Driver and has listed the ImagePath or ServiceDll as it is in the registry instead. FRST scans for a number of known infections and verifies the digital signature of the files for Services and Drivers. Where a file is not digitally signed it will be reported. A Microsoft system file that is not signed needs to be replaced with a good copy. To fix, use the Replace: command. Note: The digital signatures check is not available in the Recovery Environment. To remove a bad service or driver service, copy the line from the scan log to fixlist. Any associated file should be included separately. The tool closes any service entry that is included in the fixlist and removes the service key. Note: FRST will report success or failure of stopping services that are running. Regardless of if the service is stopped or not, FRST attempts to delete the service. Where a running service is deleted FRST will inform the user about completing the fix and the need to restart. Then FRST will restart the system. You will see a line at the end of Fixlog about the needed restart. If a service is not running, FRST will delete it without forcing a restart. The entries when included in the fixlist will be restored to their default state. The message indicates that FRST detected broken permissions and automatically fixed them during a scan. New FRST log should be taken to verify the result. If necessary, include the standard service line in the fixlist. Known legitimate entries are whitelisted. As with other areas scanned and which have a white list it does not mean that items appearing in FRST.txt are all bad, just that they should to be checked. Note: Listing Netsvc only removes the associated value from the registry. The associated service (if present under the Services section) should be listed for deletion separately. The "Created" scan reports the file or folder's created date and time followed by the last modified date and time. The "Modified" scan reports the file or folder's modified date and time followed by the date and time it was created. The size of (number of bytes contained) the file is also shown. A folder will show 00000000 as the folder itself has no bytes. Note: To avoid a very long scan time and the production of excessively large logs, the scan is limited to some predefined locations. Also, FRST only lists custom folders, but not their contents. If you wish to know the contents of a custom folder use the Folder: directive. To remove a file or folder in the one month list just copy and paste the whole line to fixlist. Lines pointing to symbolic links (the L attribute) are handled correctly. Symbolic link found: "C:\WINDOWS\system32\Link" => "C:\Windows\System32\Target"
Alternatively, the DeleteJunctionsInDirectory: directive could be used. If you have more files with similar file name and wanted to move them with one script the wildcard * can be used. Note: A question mark "?" character is ignored for safety reasons, no matter whether it is a wildcard or a substitution for Unicode characters (see the "Unicode" description under Introduction). Also, wildcards are not supported for folders. Files listed in this section are those that either, are bad, or are files in a bad location. Examples of legitimate files are the files that users have downloaded and saved to the User's directory. Another example is when a legitimate third party software keeps one of its files in User's directory. That is a bad practice by any software vendor and those files should be moved even if they are legitimate. We have seen many infections hiding their fabricated files (seemingly legitimate but malware files) in that directory and running it from there. The way files/folders are dealt with in a fix is the same as in the One month (Created/Modified) section above. This is a non-recursive scan limited to some particular extensions to get a basic idea of whether a malware file is placed in Temp root. This section is not visible if no files meet the requirements of the search. That does not mean that Temp is empty or malware free (e.g. malware could be in a subfolder not expanded by FRST) just that it does not meet the particular search parameters. For a more comprehensive cleanup of temp files, use of the EmptyTemp: command is an option. Some items in this section if missing or patched or corrupted could cause boot issues. Accordingly this scan only appears when the tool is run in RE (Recovery Environment) mode. Items are whitelisted unless they need attention. Care is required in dealing with items identified in this section. Either a file is missing or it appears to have been modified in some way. Expert help is recommended to ensure the problematic file is correctly identified and dealt with in the appropriate way. In the majority of cases there is a good replacement on the system that should be found with the Search function of FRST. Please see the Directives section for how to replace a file and Other optional scans section for how carry out a search. Primarily designed for a Bamital and volsnap malware check, currently extended to detect other anomalies. Modified system files alert you to possible malware infection. Where infection is identified care needs to be taken with remedial action. Expert help should be sought as removal of a system file could render a machine unbootable. When a file does not have a correct digital signature you will see file properties instead. In that case the file needs to be replaced with a good copy. Use the Replace: command. FRST checks %SystemDrive%\Windows\system32\drivers directory and lists locked files. Note: The random rootkit drivers are hidden and won't be listed under the Drivers section in Normal Mode. To remove the drivers and locked files, use the Recovery Mode or other tool with anti-rootkit capabilities. To fix the issue include the above line in the fixlist. FRST will set the normal mode as the default mode and the system will come out of the loop. Note: This applies to Vista and later Windows versions. Note: The "Association" will appear on the FRST.txt log when FRST is run from the Recovery Environment. When FRST is run outside Recovery Environment the section will appear on the Addition.txt. The scan in the Recovery Environment is limited to .exe file association. As with other registry entries you can just copy and paste the entries with the issue in the fixlist and they will be restored. No need to do registry fixes. Note: The "Restore Points" will appear on the FRST.txt log when FRST is run from the Recovery Environment. When FRST is run outside Recovery Environment the section will appear on the Addition.txt. The restore points are listed. Note: Only in Windows XP can the hives be restored using FRST. The restore points listed on Vista and above should be restored from RE (Recovery Environment) using Windows System Recovery Options. To fix include the line for the one you want to restore into the fixlist script. For a fix to restore from backup software (FRST saved Hives, ERUNT or CF) on Vista and above, refer to the Directive section of this tutorial. Note: The "Memory info" will appear on the FRST.txt log when FRST is run from the Recovery Environment. When FRST is run outside Recovery Environment the section will appear on the Addition.txt. Tells you the amount of RAM (Random Access Memory) installed on the machine together with the available physical memory and percentage of free memory. Sometimes this can help explain a machine's symptoms. For example the number shown may not reflect the hardware position the user believes is present. RAM reported may appear lower than what is actually on the machine. This can happen when the machine cannot actually access all the RAM it has. Possibilities include faulty RAM or Motherboard slot problem or something preventing the BIOS recognising it (e.g. BIOS may need to be upgraded). Also, for 32 bit systems with more than 4GB of ram installed, the maximum amount reported will only be 4GB. This is a limitation on 32-bit applications. Processor information, virtual memory and virtual memory available are also listed. Note: The "Drives" and "MBR & Partition Table" will appear on the FRST.txt log when FRST is run from the Recovery Environment. When FRST is run outside Recovery Environment the sections will appear on the Addition.txt. Enumerates fixed and removable drives attached to the machine at time of the scan. Not mounted volumes are identified by volume GUID paths. UEFI/GPT-based partitioning scheme: only the basic GPT layout is detected, but a complete list of partitions is not available. BIOS/MBR-based partitioning scheme: the MBR code and partitions entries are detected. However logical partitions in extended partitions are not listed. By doing this there will be MBRDUMP.txt saved where FRST/FRST64 has been downloaded to. Note: While an MBR dump can be obtained either in Normal mode or RE some MBR infections are able to forge the MBR while Windows is being loaded. Accordingly it is recommend to do it in RE. FRST looks into the system and lists the last registry backup made by the system. The registry backup contains a backup of all the hives. It is different from the LKGC (Last Known Good Configuration) backup of the ControlSet. There are a number of reasons why you might want to use this backup as a solution to a problem but a common one is where loss or corruption has occurred. The Additional scan header the contains a brief summary of information that is useful. First line: tells whether FRST 32-bit or 64-bit variant has been run. The version identifier of FRST is also shown. Second line: shows what user ran the tool together with the date and time. Third line: tells you where FRST was run from. Lists standard accounts on the system in the following format: local account name (account SID - privileges - Enabled/Disabled) => profile path. Microsoft Accounts names are not shown. You might find that the list contains leftovers of a previously uninstalled security program. In that case the line can be included in the fixlist to be removed. Lists classic desktop programs. "Modern" applications installed via Windows Store or preinstalled on Windows 10/8 are excluded. - FRST has a build-in database for flagging a number of adware/PUP programs. It is strongly recommended to uninstall the flagged program before running an automated tool to remove adware programs. The uninstaller of the adware program removes the majority of its entries and reverses the configuration changes. These programs are not necessarily bad... just hidden. They have a value in the registry called "SystemComponent" with a REG_DWORD set to 1. Those programs are not visible in Add/Remove Programs (XP) or Programs and Features (Vista and above) and the user can't uninstall them from there. FRST can remove "SystemComponent" and make the program visible to the user. Note: This fix only makes the program visible, it doesn't uninstall the program. The program should be uninstalled by the user. As stated above not every hidden program is bad. There are a lot of legitimate programs (including MS programs) that are hidden for good reasons. Lists custom classes created in user hives, ShellIconOverlayIdentifiers, ContextMenuHandlers and FolderExtensions. To fix malicious entries just add them to the fixlist and FRST will remove keys from the registry. The associated file/folder should be listed separately to be moved. Note: Legitimate third party software can create a custom CLSID so care should be exercised as legitimate ones should not be removed. Scheduled Tasks not whitelisted are shown. When an entry is included in a fixlist the task itself is fixed. Please note that FRST only removes the registry entries and moves the task file but does not move the executable. If the executable is bad it should be added in separate line to the fixlist to be moved. Note: Malware can use a legitimate executable (e.g. using sc.exe to run its own services) to run its own file. In other words you need to check the executable to ascertain if it is legitimate or not before taking action. The message indicates that FRST detected broken permissions and automatically fixed them during a scan. New Addition log should be taken to check if the unlocked task is visible (custom task) or not (whitelisted Microsoft entry). If necessary, include the standard task line in the fixlist. Lists hijacked or suspicious shortcuts in the logged in user's path and in the root directories of C:\ProgramData\Microsoft\Windows\Start Menu\Programs and C:\Users\Public\Desktop. Entries can be included in fixlist for fixing - see Shortcut.txt in Other optional scans below. Note: A Shortcut.txt scan contains all the shortcuts from all the users but the report in Addition.txt contains only hijacked/suspect shortcuts in the logged in user profile. FRST scans WMI Namespaces for non-standard registrations. Known infections are flagged. To remove the malware include the lines in the fixlist. Note: OEM software (eg. Dell) can create custom registrations. Research unknown entries for information about whether the entries are legitimate or not. Loaded Modules are white listed based on the presence of a company name. That is, items without a company name are shown. Keep this in mind because there could be a case of a bad module with a company name not showing in this scan. The size of the ADS (number of bytes contained) is shown in brackets at the end of the path. If the ADS is on a legitimate file/folder the fix will be copy and paste the whole line from the log into the fixlist. In the first case FRST only removes the ADS from the file/folder. In the latter case the file/folder will be removed. The default entries are whitelisted. So if the section is empty, there is no custom entry on the system. If any of the main keys (SafeBoot, SafeBoot\Minimal and SafeBoot\Network) are missing, it will be reported. In that case it should be repaired manually. If there is a malware made entry, it could be included in the fixlist for removal. Lists .bat, .cmd, .com, .exe, .reg and .scr file associations. The default entries are whitelisted so unless there are modified or additional entries nothing will show in the report. When any default modified entry is included in the fixlist, the default entry will be restored. Any user key, if included in the fixlist, will be deleted. Lists Internet Explorer trusted and restricted sites. If an entry is included in the fixlist, the associated entry will be removed from the registry. Supplies more details related to the Hosts file: Hosts file properties and first 30 active entries. Inactive entries (commented out) are hidden. The lines can't be processed individually. - To reset the standard file, use the Hosts: directive or include the Hosts warning line from main FRST.txt. - In case of a custom hosts.ics file, include the file path in the fixlist. There are some items FRST scans that are not covered under other headings. There is no automatic fix at the moment. Path - The entry is visible under the following conditions: the default string is missing, an incorrect placement of the default string, no Path value. To fix the Path variable, a manual registry fix or Environment Variables editor could be used. Note: The Path corruption can affect operations of some FRST directives (cmd: and Reg:) using a relative path to console tools. Wallpaper - Various crypto-malware variants use the setting to display a ransom screen. In case of malware entries, the file path can be included in the fix together with any related files found in FRST.txt. Note: Removing the malware wallpaper file will remove the Desktop background. The user should set the Desktop background. To set the Desktop background, right-click on any place on the Desktop and select Properties, select Desktop tab, select a picture, click "Apply" and "OK". To set the Desktop background, right-click on any place on the Desktop and select Personalize, select Desktop Background, select one of the pictures and click "Save Changes". DNS servers - This is useful to detect DNS/Router hijacking. Search the address on WhoisLookup for information about whether the server is legitimate or not. Note: The servers list is not read from registry so the system should be connected to internet. This can be because the user disabled UAC or as a side effect of malware activity. Unless it is clear that there is a malware cause, reference to the user should be made before a fix is attempted. Value data supported by Windows: Block | Warn | Off (Windows 10 Version 1703+) or RequireAdmin | Prompt | Off (older systems). The default entries and some third-party legit entries are whitelisted. The line is visible only if a custom entry is detected. Malicious or broken entries require a manual registry fix. Remove the matching ProviderIDx and ProviderFileNamex entries and renumber the remaining entries accordingly. See: Correcting The Registry When TAPI Providers Are Corrupted. Whether Windows firewall is enabled or disabled is also reported. When FRST is run in Safe Mode or, where there is something wrong with the system, then there will be no entry about the Firewall. The log is useful where a user has used MSCONFIG or Task Manager to disable malware entries instead of removing them. Or, they have disabled too much and can't get some needed services or applications to run properly. MSCONFIG\startupfolder: Original Path (replaced "\" with "^" by Windows)  => Path to backup made by Windows. MSCONFIG\startupreg: ValueName => Path to the file. Note: Windows 8 and newer use msconfig only for services. Startup items are moved to the Task Manager which stores disabled items in different keys. A disabled non-absent item is listed twice: in FRST.txt (Registry section) and in Addition.txt. - In case of disabled services, it will delete the key created by MSCONFIG and the service itself. - In case of disabled Run items, it will delete the key/value created by MSCONFIG/Task Manager. The Run entry itself on newer systems will be deleted too. - In case of items in Startup folders, it will delete the key/value created by MSCONFIG/Task Manager and move the backup of the file made by Windows (on older systems) or the file itself (on newer systems). Important: Fix an entry from this section only if you are sure it is a malware entry. If you are unsure about the nature of the entry, do not fix the entry to avoid deleting legit items. In case of disabled legit items that should be enabled, a user should be instructed to turn them on via MSCONFIG utility or Task Manager. Lists FirewallRules, AuthorizedApplications and GloballyOpenPorts. If an entry is included in the fixlist, it will be removed from registry. Any eventual file will not be moved. By checking a box under Optional Scan FRST will scan the requested items. Boot Configuration Data is listed. These can then be checked for validity. Lists all types of shortcuts from all standard accounts. Hijacked entries can be included in the fixlist to be restored or removed. To fix the ShortcutWithArgument: lines, just copy and paste the lines into the fixlist. But to remove the Shortcut: objects add the paths separately to the fix. Note: FRST removes the argument from shortcuts except for Internet Explorer (No Add-ons).lnk shortcut. That shortcut argument by default is not empty (the argument is -extoff) and is used to run Internet Explorer without add-ons. It is vital for troubleshooting IE issues so this shortcut argument will be restored. Also note that if you run another removal tool to remove the argument from Internet Explorer (No Add-ons).lnk, FRST will not list it under ShortcutWithArgument: and so the argument can't be restored with FRST any more. In that case the user can restore the argument manually. In Target box Add two spaces and then -extoff to the listed path. When the "90 Days Files" option is checked, FRST will list "Three months (Created/Modified)" instead of "One month (Created/Modified)". When the Search Files button is pressed the user is informed that the search is started, a progress bar appears, then a message pops up indicating that the search is completed. A Search.txt log is saved at the same location that FRST is located. Note: The X: drive will only contain 64bit executables for 64bit systems. The "Search Files" button can be used to perform additional searches, see FindFolder: and SearchAll: below. Results will be recorded in the Search.txt log. Contrary to a file search, when carrying out a registry search, adding wildcards to the search terms should be avoided because the wildcard characters will be interpreted literally. Where a wildcard ("*" or "?") is added to the start or end of a registry search term, FRST will ignore it and will search for the search term without the character. A SearchReg.txt log is saved at the same location that FRST is located. Note: The Registry search function will only work outside RE. Do not add wildcards to the term(s). FRST automatically interprets the term(s) as *term(s)* in case of files and folders. Note: The full search performed in the Recovery Environment is limited to files and folders. All the commands/directives in FRST should be on one line as FRST processes the script line by line. Note: Directives/Commands are not case sensitive. Closes all the non-essential processes. Helps to make fixing more effective and faster. When this directive is included in a fix it will automatically apply a reboot. There is no need to use the Reboot: directive. The CloseProcesses: directive is not needed and not available in the Recovery Environment. Occasionally you need to run CMD command. In that case you must use "CMD:" directive. If there is more than one command, start each line with CMD: to get an output log for each command. The first command will copy the minidump files to flash drive ( if the drive letter for flash drive is E). The second command is used to fix the MBR in Windows Vista and higher. Alternatively, the StartBatch: — EndBatch: directives could be used (see below). Note: Unlike the native or other FRST directives the cmd commands should have the proper cmd.exe syntax, like use of " quotes in case of a space in the file/directory path. To copy files or folders in a style similar to xcopy. The destination folder will be automatically created (if not present). Note: For replacing single files, it is recommended to use the Replace: directive. In case of an existing target file Copy: only tries to overwrite the file, while Replace: additionally tries to unlock and move the file to Quarantine. Creates a locked dummy folder to prevent a restoration of a bad file/folder. The dummy folder should be removed after neutralizing the malware. To create a restore point. Note: This directive works only in normal mode. It also fails when System Restore has been disabled. The most efficient way to delete keys/values, bypassing limitations of the standard deletion algorithms present in Reg: and StartRegedit: — EndRegedit:. The directives have the ability to delete keys/values that are locked due to insufficient permissions, keys/values that contain embedded-null characters, and registry symbolic links. No need to use the Unlock: directive. For keys/values that are protected by a running software ("Access denied" response) you need to use Safe Mode (to circumvent the running software) or delete the main components before using the commands. Note: If the listed key for deletion is a registry link to another key, the (source) key which is the registry symbolic link, will be deleted. The target key will not be deleted. This is done to avoid removing both a bad registry symbolic link that might point at a legitimate key and the legitimate key itself. In a situation where both the source key and the target key are bad, then they both should be listed for deletion. After finishing with cleaning, the %SystemDrive%\FRST (usually C:\FRST) folder made by FRST tool should be removed from the computer. In some cases the folder can't be removed manually because the %SystemDrive%\FRST\Quarantine folder contains locked or unusual malware files or directories. The DeleteQuarantine: command will remove the Quarantine folder. Tools that move files as opposed to deleting files should not be used to delete C:\FRST as those tools just move the files to their own directory and it remains on the system anyway. Note: The automatic FRST uninstallation (see the description under Introduction) includes the same ability to delete a locked Quarantine. FRST will set the service to Disabled and the service will not run at the next boot. Note: The service name should be listed as it appears in the registry or FRST log, without adding anything. For example quotation marks are not required. When EmptyTemp: directive is used the system will be rebooted after the fix. No need to use Reboot: directive. Also no matter if EmptyTemp: is added at the start, middle, or end of the fixlist it will be executed after all other fixlist lines are processed. Important: When the EmptyTemp: directive is used items are permanently deleted. They are not moved to quarantine. Note: The directive is turned off in the Recovery Environment to prevent harm. More reliable way to inspect a key content. The directives overcome some regedit.exe and reg.exe limitations. The difference between the directives is a scope of the export. ExportKey: lists all values and subkeys recursively, while ExportValue: shows only values in the key. HKEY_LOCAL_MACHINE\SOFTWARE\Suspicious Key\LockedKey => Access Denied. Note: The export is meant for research purposes only and can't be used for backup and import operations. To check file properties. Multiple files can be included, separated by semicolons. Note: The File: directive does not provide an automatic upload to VirusTotal, unlike the VirusTotal: directive. To check a folder content. FilesInDirectory: is meant to list specific files matching one or more wildcard * patterns, while Folder: is designed to get the full content of a folder. Output from both the directives includes MD5 checksums. Note: The Folder: directive works recursively and lists the content of all subfolders. Therefore, it might produce gigantic logs. See Search features in the Other optional scans section. The directive works in the same way as FindFolder: in the Search box, but results are recorded in the Fixlog.txt. To reset the hosts. Also, see hosts in the Main scan (FRST.txt) section. Used to list permissions on the files/directories/keys included in the script. The tool moves the destination file to the Quarantine (if present) then moves the source file to destination location. Note: Renaming can be carried out when using the Move: directive. Note: The destination path should contain the file name even if the file is currently missing in destination directory. To run PowerShell commands or script files. Powershell: command > "Path to a text file"
Powershell: command | Out-File "Path to a text file"
Powershell: "Path to a script file"
Alternatively, the StartPowershell: — EndPowershell: directives could be used (see below). It doesn't matter where in the fixlist you put it. Even if you put it at the start, the reboot will be carried out after all the other fixes are completed. Note: This command will not work and is not needed in the Recovery Environment. To manipulate Windows Registry using Reg command line tool. Note: Unlike the native FRST directives, the Reg command should have the proper reg.exe syntax, like use of " quotes in case of space in key/value name. Note: The directive won't handle locked or invalid keys/values. See the DeleteKey: and DeleteValue: description earlier in the tutorial. To remove (not move to Quarantine) directories with limited permissions and invalid paths or names. No need to use the Unlock: directive. RemoveDirectory: should be used for directories that resist the usual move operation. If it is used in Safe Mode it should be very powerful and in RE it should be most powerful. Removes some Internet Explorer policy restriction settings like "HKLM\SOFTWARE\Policies\Microsoft\Internet Explorer" or ProxySettingsPerUser in HKLM\SOFTWARE\Policies\Microsoft\Windows\CurrentVersion\Internet Settings. It removes "ProxyEnable" (if it is set to 1), "ProxyServer", "AutoConfigURL", "DefaultConnectionSettings" and "SavedLegacySettings" values from the machine and users keys. It also applies the BITSAdmin command with NO_PROXY. In addition, it removes the default value of the "HKLM\SYSTEM\CurrentControlSet\services\NlaSvc\Parameters\Internet\ManualProxies" key if it is altered. Note: Where there is a running software or a service, that restores those settings, the software should be uninstalled and the service should be removed before using the directive. This to ensure the proxy settings don't return. The tool moves the destination file (if present) to Quarantine then copies the source file to destination location. It will not move the source file and the source file is still in its original location. So in the above example dnsapi.dll in WinSxS directories will be there for future. Note: In case of missing destination directory, the command will fail. FRST doesn't rebuild a complete directory structure. The Copy: directive could be used instead. (Note: The MBR to be restored should be named MBR.bin and should be zipped and attached). You can restore the whole content of Quarantine or restore single or multiple file(s) or folder(s) from Quarantine. Note: If a file already exists (outside Quarantine) in the destination path, FRST will not overwrite it. The original file will not be moved and will remain in Quarantine. If however, you still need to restore the file from Quarantine then the file in the destination path should be renamed/removed. Refer Drives and MBR & Partition Table section in the tutorial. Note: By doing this there will be MBRDUMP.txt made on the flash drive that should be attached to the post by the user. Created for locked system files. It sets group "Administrators" as owner and depending on the system grants access rights to the standard groups. Note: The directive will not set TrustedInstaller as the owner but still it could be used for system files that are locked by the malware. To create and run a batch file. The output will be redirected to the Fixlog.txt. A better alternative to create and run a PowerShell file containing multiple lines (see the Powershell: directive earlier in the tutorial). To create and import a registry file (.reg). Including Windows Registry Editor Version 5.00 header is optional, but REGEDIT4 header is required. Note: The confirmation line appears regardless of any eventual errors in your .reg file. Note: The directives won't handle locked or invalid keys/values. See the DeleteKey: and DeleteValue: description earlier in the tutorial. Lists additional tasks details related to execution time. Note: The directive is not supported on Windows XP and works only in normal mode. Note: For Windows Vista and later, not supported on Secure Boot enabled devices. Inspect the Drivers section looking for a driver matching the warning. Depending on the situation, include the driver together with the warning or the warning alone in the fixlist. This directive, in the case of files/directories, sets group "Everyone" as owner, grants access to Everyone and works recursively when applied on directories. It should be used for bad files/directories. To unlock system files, use the SetDefaultFilePermissions: directive. In the case of registry items it sets group "Administrators" as owner and grants the groups the usual access and works only on the key applied. It can be used for both bad and legitimate keys. Sometimes the usual move operation doesn't work due to permissions. You will notice it when you get "Could not move" on the Fixlog.txt. In that case you can use the "Unlock:" directive on those files or folders. Note: The DeleteKey: directive could be used instead of the Unlock: and Reg: combination. To check the digital signature for a file. To check files with VirusTotal. FRST will search for earlier analysis in the VirusTotal database. A file that has never been submitted to VirusTotal will be uploaded for analysis. Multiple files can be included, separated by semicolons. "0-byte MD5" indicates that either a file is in use or is locked or is empty or the path refers to a symbolic link. To zip files/folders and save them as Date_Time.zip to the users desktop for subsequent manual uploading by the user. More than one archive will be created for files/folders with duplicated names. As many files/folders as needed can be listed, separated by semicolons. 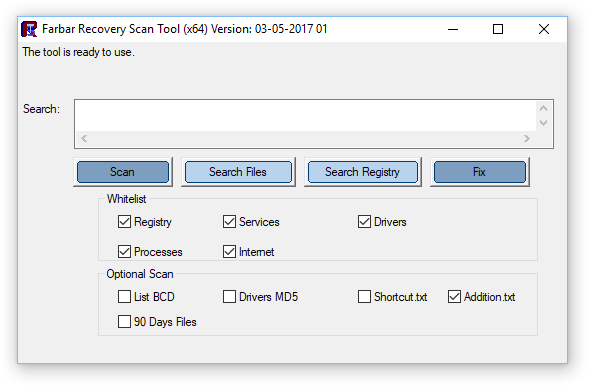 Please download [url=https://www.bleepingcomputer.com/download/farbar-recovery-scan-tool/]Farbar Recovery Scan Tool[/url] and save it to your Desktop. [*]Right click to run as administrator. When the tool opens click [b]Yes[/b] to disclaimer. [*]It will produce logs called [b]FRST.txt[/b] and [b]Addition.txt[/b] in the same directory the tool is run from. [*]Please copy and paste the logs back here. [*]On a clean machine, please download [url=https://www.bleepingcomputer.com/download/farbar-recovery-scan-tool/]Farbar Recovery Scan Tool[/url] and save it to a flash drive. [*]In the command window type in [b]notepad[/b] and press [b]Enter[/b]. [*]The notepad opens. Under File menu select [b]Open[/b]. [b]Note:[/b] Replace letter [b][color=#FF0000]e[/color][/b] with the drive letter of your flash drive. Download attached [b]fixlist.txt[/b] file and save it to the Desktop. [u][b]NOTE. [/b][/u] It's important that both files, [b]FRST/FRST64[/b] and [b]fixlist.txt[/b] are in the same location or the fix will not work. Run [b][color=#0000FF]FRST/FRST64[/color][/b] and press the [b]Fix[/b] button just once and wait. Now please enter System Recovery Environment Command Prompt. Run [b]FRST/FRST64[/b] and press the [b]Fix[/b] button just once and wait. The tool will generate a log on the flashdrive ([b]Fixlog.txt[/b]) please post it in your reply. Comment to the tutorial may be made here. Press "Show" to see previous years amendments. 12/30/2013 Further explanation added to the Search Feature. 08/28/2014 In One Month Created Files and Folders and One Month Modified Files and Folders section, a note added that a wild card will not work for Folders. 08/28/2014 Explanation of where a section will be found in and outside RE for scan areas EXE ASSOCIATION, Restore Points and Memory info added. 12/02/2014 Reference to the alert for possible corruption in the Chrome "preferences" file removed. Changes to Chrome render it no-longer relevant. 12/02/2014 Reference to Google Chrome DefaultSearchProvider removed. Changes to Chrome render it no-longer relevant. 09/01/2015 Fixing section updated to reflect change in Internet Explorer reporting. 09/07/2015 Example header for the Addition.txt section updated. 10/09/2015 Windows 10 capability added to "What it will work with"
11/13/2015 Where another language version of FRST is being used an explanation of how to get an English log added to the Introduction. 06/16/2016 "90 Days Files" description amended to include the "Modified Files and Folders"
02/25/2018 testsigning on: description replaced with a generic and simplified version.